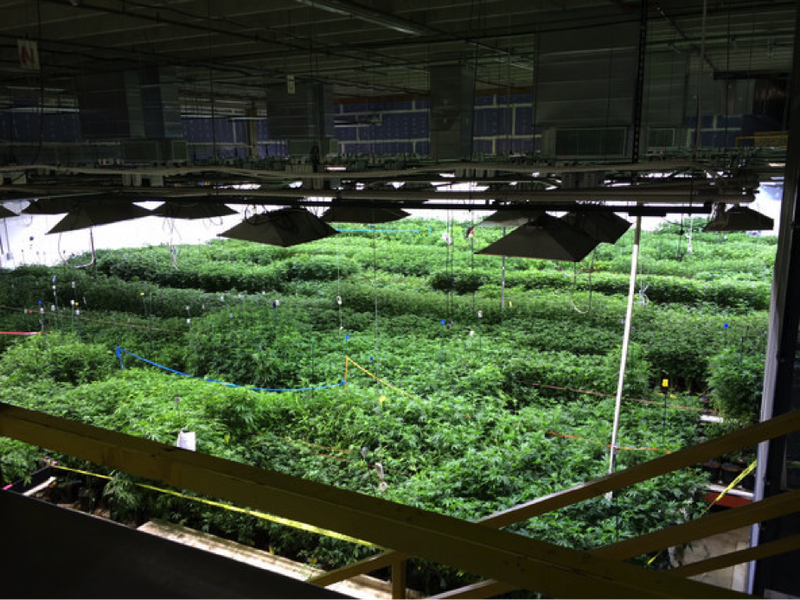 When newspapers and television run a cannabis story, it is frequently accompanied by photos or video of vast, cavernous warehouses filled with veritable oceans of plants. Photos used to illustrate stories in the New York Times and Denver Post serve to illustrate this point. 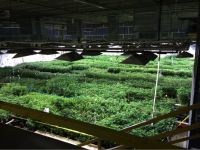 This type of facility design is sometimes referred to in the cannabis industry as a “perpetual harvest” model. This is because plants are harvested piecemeal – one row at a time, for example – with new plants ready to flower replacing the recently harvested ones. In this model, flowering plants of various ages occupy the same space and the room is never completely harvested and empty, hence the “perpetual” moniker. This is in contrast to more compartmentalized facility designs, in which flowering plants are segregated in smaller groups in various rooms, which are then harvested completely before the room is cleaned and new plants ready to flower replace the previous ones. The perpetual harvest setup appears impressive and lends itself well to portraying the volume of production being achieved in large facilities. This is likely why I have seen such models, or similar ones, copied in other states. Prospective entrants to the industry have also approached my firm with such designs in mind for their cultivation facilities. However, we generally advise against the perpetual harvest facility model, as this type of design imposes serious difficulties upon operators. Problems arise primarily in the areas of pest and contamination mitigation, ability to properly observe pesticide use and worker safety guidelines, and inefficiencies in lighting and HVAC usage. The problems noted are linked to the perpetual harvest design and can be mitigated with increased compartmentalization. Before getting to my recommendations, however, lets run down the issues created by the perpetual harvest model. In many photos I see of perpetual harvest facilities, the ceilings are extremely high, as are the light fixtures in most cases. This is likely the result of one of the main perceived advantages of such spaces, which is that they require minimal construction prior to getting up and running. There are no walls to be put up or ceilings lowered, and the lack of compartmentalization makes running wires and ducting much easier. However, whatever capital was saved in initial construction will likely be burned up by increased ongoing operational costs. High ceilings such as those in the above photos mean more cubic footage that climate control systems must cool or heat. Additionally, due to the great height of the light fixtures, plants are not getting the most bang for their buck, so to speak, compared to designs that allow lights to be lowered appropriately to provide optimal intensity and spectrum. 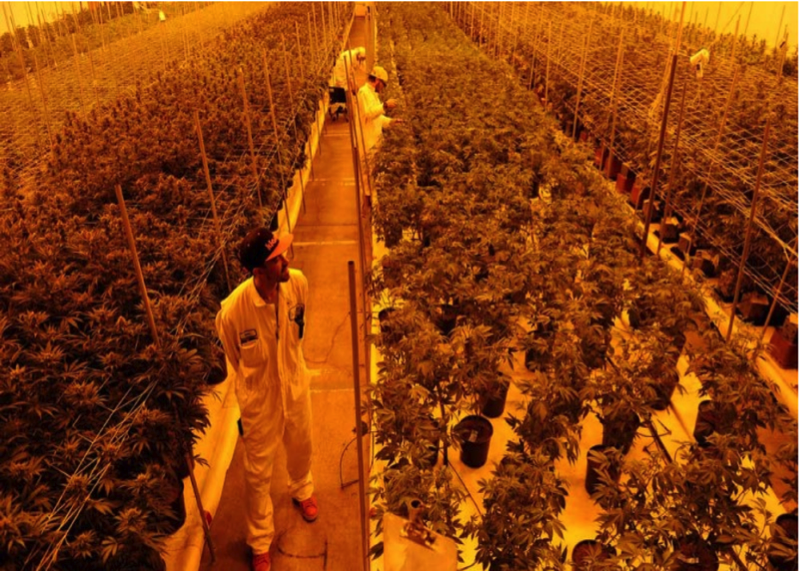 Double-Ended High Pressure Sodium (DE HPS) lamps are probably the most common type of lighting in use for flowering by commercial cannabis cultivators today, and they are ideally situated about four feet above the canopy when running at full capacity. For businesses aiming for a no-frills production model with minimal attention to the light management needs of individual cannabis cultivars (or strains, as they are commonly referred to), then this consideration may be moot. However, those operations attempting to produce the highest-quality flower and plant material know the value of proper light management, as well as the fact that some cultivars respond differently than others to intense light. Indeed, I have observed cultivars that produce more when light intensity was decreased, while others thrived under intense light that would have seriously damaged others. This makes the one-size-fits-all approach to light management I’ve seen in most perpetual harvest designs generally detrimental to the quality of the final product, in addition to using the same amount of energy, or more, to achieve that lower quality result. Such a design makes it easy for a small pest incursion to become a full-blown infestation. Because plants about to be harvested are sharing space with plants just beginning their flowering process, this means that both current and future harvests will be affected, or even lost entirely if the pest problem is severe. Having plant groups of different ages share the same space is generally unadvisable. This is because older plants, particularly those close to harvest, are weaker and more susceptible to pests by virtue of the fact that their life cycles are nearing an end. On the other hand, a more compartmentalized facility design provides physical barriers that can contain mites and mildew spores to some extent, limiting the damage done by individual pest incursions. One of the essential tasks in an indoor cultivation operation is sterilizing just-harvested spaces to ensure that the subsequent run gets off to a clean start. This task could conceivably be performed in a perpetual harvest model; say, for example, trays, trellis frames, and other equipment are scrubbed after a row has been cut down and removed for drying or processing. However, due to the fact that there are always other plants in the room, it seems impossible for any plant group to get an assuredly clean start, as other plants may be harboring bugs, mold spores, or viruses, despite not showing signs or symptoms. The presence of plants also eliminates the possibility of using cleaning agents such as bleach, which gives off harmful fumes, but is sometimes necessary to completely sterilize an area that might have previously experienced some amount of powdery mildew or botrytis. In Part II of this series, I will discuss some problems with pesticide use and worker safety regulations as well as provide recommendations for compartmentalization in cultivation facilities. Stay tuned for Part II of A Case for Compartmentalization: Problems with “Perpetual Harvest” Models in Cultivation, coming out next week.